We both noticed that, when the topic of the week is somehow positive, our moods is generally higher, because, by tracking optimistic sensations, we acknowledge the good things that fill our lives. The contrary is proven as well: when the weekly theme is gloomy, our state of mind is overall lower. But we wanted to share our "negative thoughts" for a week anyway. I tracked every negative and pessimistic feeling that dawned on me regarding present situations or any anticipation about the future. I tried to discern whether it was anxiety, fear, preoccupation, frustration, disappointment, panic, generic sadness or just pessimism; and I linked each thought to the eventual cause. I also indicated its duration: did it last for a while? Or, was I able to let go of it quickly? And, how painful was it? This week was a particular one. That was the moment we realized that, for work reasons, my boyfriend would probably spend the next 2 months in Italy, thus we would be far apart for the longest time in our relationship. My boyfriend and I spend a great amount of time together. Since we’re partners at work, we practically are with each other 24 hours a day. We also share the same group of friends and we generally like spend at least 3 or 4 evenings a week just between the two of us, having drinks and dinner and talking about the more "strategic" aspects of our job and fantasizing about the future. And we very much like it! Also, I don’t particularly enjoy being on my own, to be honest. I’ve never (and will probably never be) the kind of person who can - for example - enjoy a vacation on my own, or who can be truly happy to spend evenings with my book and by myself. No surprise that, this week, most of my negative thoughts run around his eventual departure: could I be happy for two months even without him? That is a challenge! 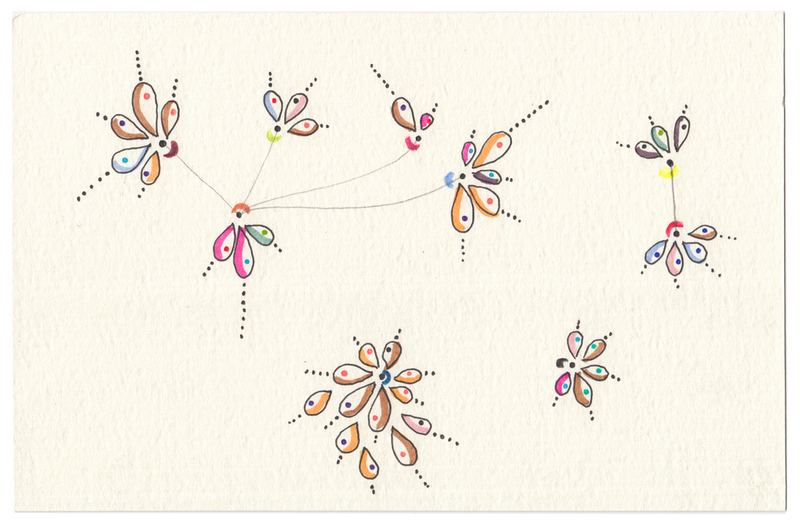 In my postcard, every petal (or “tear”?) is one negative thought. 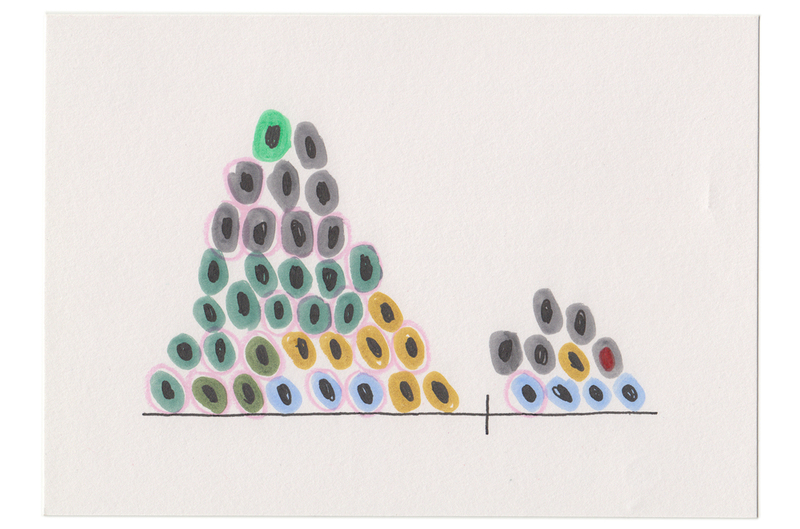 Feelings are grouped by type of sensations, while the petals' dimension indicates the level of pain it caused me; and the number of dots growing out from it represents the duration. The main color is the main topic: what was my negative sensation about? The little internal dots are the reason: why was I sad? in my data-tracking, I tried to keep the "why" separated from the “what”: to try to discern the main cause of my pain and thus reflect on myself a little more. 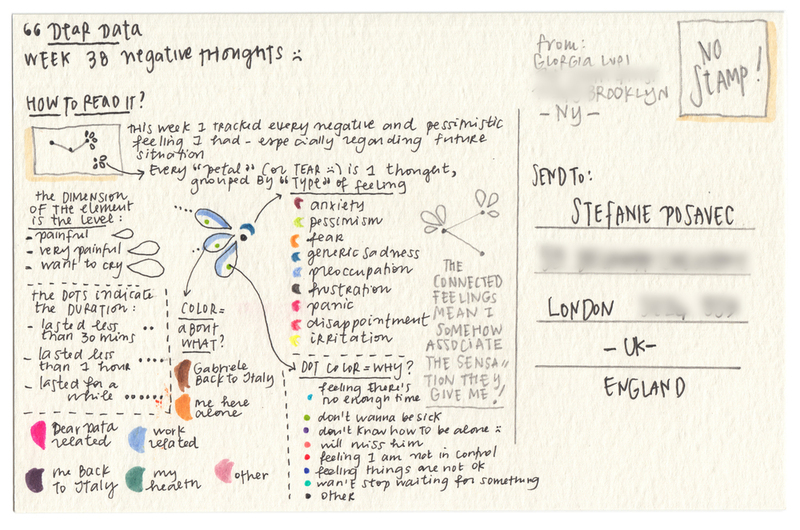 Stefanie’s postcard made me sad in the beginning: how many negative feelings toward herself! probably it’s just the way she is, and this part of her is probably crucial to her talent. But then I realized she also added positive notes! She tried to balance the negativity with a positive and grateful feeling, what a nice idea! So I was finally glad and relieved to see that, after all, most of her pessimistic feelings have been combatted! Good job!! It turned out my boyfriend left for real for a month an a half, not immediately, but in 3 weeks from this postcard's conception. Given I will be in New York alone for a while, and spending a lot of time alone, my next Dear Data days will definitely be different than my previous ordinary ones! On a positive note: I like to track data in weeks or situations that are out of the ordinary, I like that those particular moments of my life are “on Dear Data”, they will become a "physical" memory, a memory clearly displayed on my postcards. I also think that recording data while experiencing non-routinely days helps me observe how these changes affect my thoughts and my mood. Keeping this diary has already brought so many memories, I wonder how it will be to read our postcards years from now! Well, this is a cheery week to write about, isn’t it? 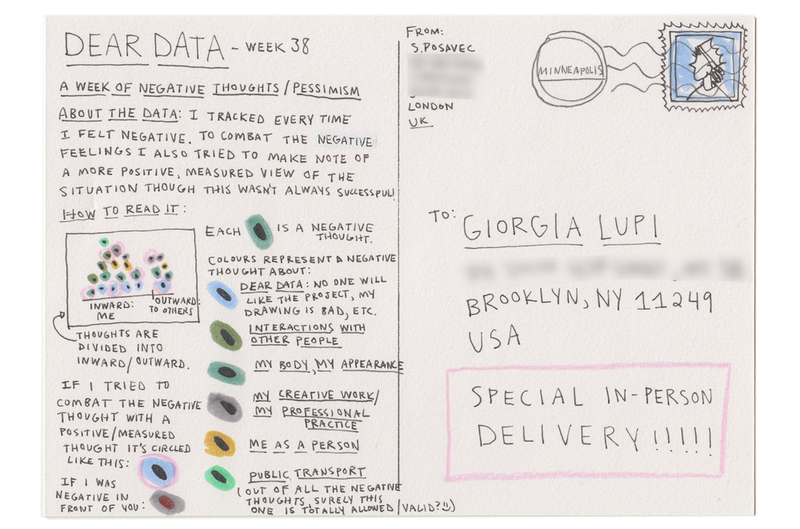 I’m not really sure why Giorgia and I take pleasure in gathering data on these slightly-depressing parts of our lives, but I guess that’s the point: by tracking the times when we are thinking negatively, we will be forced to notice our behaviour patterns and reflect upon it. I think I like to wrap myself up in pessimism and negativity as a way of protecting myself: if I think the worst, then I can’t be disappointed if something doesn’t go as planned, because I knew it wouldn’t in the first place, right? I’ll admit this isn’t exactly the ideal way of coping with life, and there are more positive ways to deal with uncertainty, but I find it hard to break this habit. Because of this, I was worried about this week of data-gathering because (as I saw during our week of envy) focusing on negative thoughts can often make me feel worse. So, as a precaution, in my data tracking I tried to balance each negative thought with a positive thought to prevent me from tumbling into a pessimistic gloom. This was another week where I spoke about my work at a conference, just like our week of envy. I noticed a similar pattern with these thoughts like the last week I was speaking at a conference: I had loads of negative thoughts before I spoke, then after I spoke about my work, I felt less negative. I can tell I'm trying to protect myself with pessimism: thinking the worst just in case my talk is unsuccessful. While I tried to combat negativity with a positive thought, soon I gave up and just wallowed in these depressing thoughts, feeling quite miserable, actually. The very act of capturing and filing away these thoughts seemed to amplify these feelings and hold them in my mind for longer. Now, looking over the collected data, we have an (obvious) winner: of course I directed most of my negativity toward myself! No surprise there. I think the problem with this type of negative-data-tracking is that the outcome of looking at the dataset is to reinforce the bad feelings instead of offer one insight on how to overcome these feelings. Looking over this data is difficult. I’m not sure if I would really want to track these sorts of topics again, as I think they do more harm than good. Finally, I've noticed that my inward-looking negativity is different to Giorgia’s negative thinking, which (from looking at her card) tend to be mainly directed externally as opposed to internally. Through this project I’ve always envied Giorgia’s confidence, particularly when it comes to her work, and wish that I could be the same way where even during bad times (like Giorgia had during this week) I would be able to cope without continually focusing my negativity upon myself.